Cloud Platform has arrived in Latin America - customers can now run their workloads and store data in São Paulo. Our São Paulo region is now open. 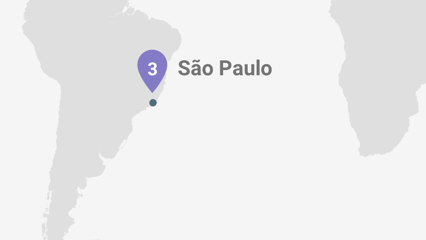 You can now select São Paulo as a GCP region, enabling users in Latin America to use compute, big data, networking and storage closer to home. Google is investing in Latin America with new submarine cables. Monet connects US to Brazil, Tannat connects Brazil, Uruguay and Argentina, and Junior will connect Rio to Santos.These submarine cables investments provide Google customers with private, high-speed connection to their cloud data. The LATAM region has now 3 zones. Developers and network admins can distribute apps and storage across multiple zones to protect against service disruptions. Learn about our network. With Google Cloud Platform, you don't need to make commitments to get great prices. By paying for services on an as-needed basis, you save money and direct more focus to innovation. And now with the advent of the São Paulo region, Brazilian clients will be able to buy our services directly in Reais (R$).View our pricing. Customers Have Been Looking Forward To The Launch Of The GCP Region In Latin America. "With the arrival of the Google Cloud Platform region in Brazil, Dotz sees the opportunity of leveraging all it's current businesses. We are excited about the new possibilities that we can take advantage of with the opening of the new region, expanding the current use of the tools that we are working on the GCP." "We’re excited that GCP will be offering soon a region in São Paulo. Contabilizei has been a GCP client since 2013, and our fast growth was possible thanks to GCP tools. We believe that this launch will improve our services performance, and will contribute to the growth of the Latin American community of Google Cloud Platform users. The launch of the São Paulo GCP region will continue to support us in order for Contabilizei continue delivering services 90% cheaper than traditional accountants." "Most of our customers and partners are based in Brazil. The launch of the Google Cloud Platform region in São Paulo will improve the latency of GCP products, and bring down the last barrier in order to us massively use the Google Cloud Platform services for our customers." Today, what you know and how well you use it is fueling your competitiveness and growth. The way your firm provisions and manages data has to change to keep up with empowered customers and nimble competitors. This Forrester report lays out the new imperatives to enable self-service access to real-time data. Download this HBR report to be better prepared for the necessary digital transformations that all companies are facing recently. As the pace of technology change accelerates, risk-averse organizations will be left behind, according to this Gartner report. How can CIOs drive growth and success despite having to constantly reset their expectations about the future? Find out what should be on your business radar. Google Cloud Platform partners in Latin America can design and support your deployment, migration and maintenance, etc. Our customer-friendly pricing is on average 60% less for many compute workloads compared to other cloud providers. By paying for services on an as-needed basis, you save money and direct more focus to innovation. Sul América significantly reduces IT costs and furthers innovation with Google Cloud Platform. How Vimeo tuned adaptive video delivery with Google Cloud Platform and Fastly's CDN. Ubisoft scales online gaming using Google App Engine and Google Cloud Storage. With Google Cloud Platform Spotify is turning data into value thanks to our BigQuery tool. Discover how Contabilizei has created a proprietary web and mobile-enabled service, using Google Cloud Platform.